Chinese herbal medicine is another branch of China's traditional medical system and like acupuncture it has been tried and tested on millions of people for at least 2000 years. When prescribing herbs for a patient typically 6 to 12 herbs are used that will treat that patient's problem and 'pattern of disharmony'. A pattern of disharmony means that 10 people could all have a headache but these 10 people will all have different constitutions, symptoms and signs that will allow for a more detailed differentiation into a number of patterns. Herbs are then selected based on their problem as well as their pattern of disharmony so that there is rarely one prescription for everyone. It is this that makes it particularly effective and holistic in every sense. There are no animal or mineral products allowed for use in the UK at the moment so all of the 'herbs' are indeed plant based i.e. roots, barks, seeds, flowers, etc. 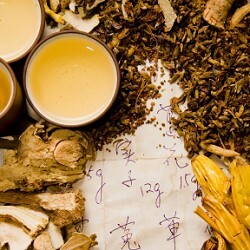 The herbs come as either tablets or as a powder that can be added to warm water and drunk depending on your preference.